C.M. Mayo: Welcome to Marfa Mondays. I'm your host, C.M. Mayo, and this is Podcast 13 of a projected 24 podcasts exploring Marfa and the wider Big Bend region, apropos of my book-in-progress about Far West Texas. So far in the series I've interviewed people in and around Marfa and also reported on my visits to some very remote and intriguing places in the Big Bend, most recently, interviews with Dallas Baxter, founder of Cenizo Journal; and with luthier and cowboy poet singing some cowboy songs, Michael Stevens; and a visit to Swan House, Simone Swan's adobe teaching house, inspired by the legacy of Egypt's greatest architect, Hassan Fathy. I invite you to listen to these podcasts and all the others anytime at my website, cmmayo.com, and through the website, send in your comments. I'm always delighted to hear from listeners. Now in this podcast I take a big step back to get some perspective big perspective. Bigger than Texas perspective. Those of you who know Far West Texas know how close Mexico is in every sense. Look at a map and you'll see, from Marfa it's only a little more than an hour's drive to Presidio, which sits on the Rio Grande; cross over and there you are: Mexico. That's what we're going to hear about in this interview with John Tutino. C.M. Mayo: We have Making a New World and the related anthology, Mexico and the Mexicans in the Making of the United States. These are closely related, and they are both nuclear bombs! C.M. Mayo: They're huge paradigm-busting... across from the beginning when we had the expansion of New Spain in the 1500s to modern day immigration. My head is reeling with all this stuff that's in these two books! John Tutino: And I will say, you're right, they evolved together. They were a long time coming, decades in the rumination and a decade plus in the focused production. And yeah, I got to the point where I said, "The whole basic big picture of where we thought Mexico fit in the world is somewhere between wrong and mythical." And you can't change that by chipping away at the edges and saying, "look at this little piece." And so I ended up writing Making a New World to just try to say, "New Spain, which is the root of Mexico, was absolutely an pivotal place to the origins of the modern world, modern capitalism, and equally absolutely pivotal to the origins of the United States." And I was working on one when I figured out the other. C.M. Mayo: My sense is that in Anglo-American culture, we've always had this idea that, here is American history over here, and here is Mexican history over here, and yes, there was war and there was this, and there was that, but you could like put a little bell jar on top of each subject, and what you're sayingand I know is true is that, no, you have to look at them together. John Tutino: Yeah. I will tell you a story. I, years ago, put together a NEH [National Endowment for the Humanties] Summer Seminar for school teachers on the interrelated histories of Mexico and the United States. NEH, the grant proposal group, approved it. They wanted to fund it, but the staff at NEH refused my title, which was "Inseparable Histories: Mexico and the United States." They said I could teach the seminar this was in the early '90s not having the primary title "Inseparable Histories," and I tactically said, "Well, I want to do the seminar. I'll negotiate the title." But that's the extent that this goes there. John Tutino: They have sort of bought into a notion, they have been trained in a notion, that Mexico had its base in great Pre-hispanic societies that were destroyed by Spanish colonialism for three centuries, and then there has been a struggle to reconstitute something positive. And boy, there were destructions in early 16th century, though I argue they're more disease driven than anything any human could impose. And yes, there have been struggles, but people have... I don't fully understand, why not glory in the... You know, it's a typical history, it's a history of enormous economic dynamism and thus enormous conflict, change, human greatness, human exploitation, human difficulty, but it sort of puts New Spain and Mexico, I believe, at the absolute mainstream of modern history. C.M. Mayo: So, in other words is as you call "this enduring presumption" was that capitalism started with England. John Tutino: Well, either way. If you ask Anglo Americans, it's their gift to the world. If you ask people who've experienced it without prosperity... And this is part of what I try to do. I think too often we argue that capitalism is easily the most positive thing the world has ever seen or it's the most dastardly thing the world has ever seen, and I just see capitalism as a dominant historical reality with enormous creativities, positives, productive gains and, linked to it, changing rounds of difficulties, conflicts, human difficulties, exploitations, and we've got to quit arguing one against the other. We've got to figure out how to maximize one, minimize the other, but as a historian I just want to understand it. In terms of that I should emphasize, in terms of taking Anglocentrism away from the study of global capitalism, I have jumped on a bandwagon there. It really came out of Asianists. One part, Andre Gunder Frank who started writing on Latin America years ago, then went to China and wrote a book called ReOrient, and Kenneth Pomeranz, who wrote a book called The Great Divergence, and I will say Gunder Frank was more the cage-rattling ideologue and Pomeranz was more the careful historian. He's currently, it took 10 years after the book, but he's now president of the American Historical Association. But the two of them together right around the year 2000 said, in 1600 China was the dominant economy in the world, Western Europe was a minor player and they contended for three centuries, and before 1800 nothing made it certain that Europe was going to rise to dominance and Asia was going to fade. It was a historical give and take, and then some particular things happened around 1800 that shift this. They were debating this and they were all recognizing that silver was pivotal to this world economy. John Tutino: Acapulco to Manila. And people always ask, "Why is Manila part of the Spanish empire?" It was a city of Chinese merchants under Spanish sovereignty who traded goods not just from China but from India, Indonesia, and sent them back. Have you ever been to what is now the Museo del Virreinato in Tepotzotlan on the road? C.M. Mayo: And this doesn't fit with the image of Mexico in Anglo-American cultural history or our modern media at all. John Tutino: As a backward, exploited, crushed environment that Spanish colonialism just ground to nothing! And one of the ironies is... and we have a hard time thinking about it. So New Spain, I argue, was probably one of the three core regions of early modern capitalism, while Spain, its mother country, was in decline. And we've just got to learn to get over the presumption that Spain could be in decline as a European power but New Spain could be just flourishing. C.M. Mayo: What I loved about the opening of your book, Making a New World, was you start talking about...to illustrate your points, the individual biographies of several people in the very important city of Querétaro. And as a bit of digression I want to say, I'm an American and I've been living in Mexico all these years, and I come back and forth frequently, and it is very rare that anybody in the U.S. has even heard of Querétaro, and yet Querétaro plays a central role in the development of the Mexican economy from almost the very beginning. John Tutino: I will note it's also coming back. It may be the single most dynamic place under the current NAFTA-driven economic revival. And Querétaro really became probably my favorite place in Mexico in the process of writing this book. I had been introduced to Mexico as a 17-year-old kid going to San Miguel de Allende and I'd lived for a full year in Mexico City, lots of time in other central Mexico places, most of all in Mexico City, but when I started doing this and started spending between two weeks to a month every year in Querétaro, and the mix of its colonial heritage and its modern dynamism just made it. It isn't a museum like San Miguel. My apologies to the San Miguel tourist bureau. [Laughs] It's a real dynamic city but with a wonderful historic arc. C.M. Mayo: It's a group of cities north of Mexico City, kind of in the very heart of Mexico. John Tutino: Zacatecas isn't quite Bajío in Mexican parlance because it's north, it's dry, but the Bajío fed it because, precisely, Zacatecas is mining wealth in dry uplands. Where did Zacatecas get its food? So the Bajío is also in a sense sustaining places like Zacatecas. John Tutino: Yes, Colombini. And later in the book there's huge excerpts from a poem he wrote in honor of Our Lady of Pueblito, the local Otomí virgin who historically and still in many ways centers popular devotions in Querétaro, the way Guadalupe has historically around Mexico City. Let me quickly go through my favorite vignette. The first one is Connín. Connín is an Otomí trader, frontiersman. He had traded across the frontier into the land of the Chichimecas. When Spaniards came he claimed to have been a lord; we don't know if he really was but he was able to mobilize followers with a little bit of army, a little bit of settlement, and he, an Otomí trader or lord with somewhere between dozens and a few hundred Otomí friends, relatives, villagers recruited only a couple of Spanish Franciscan friars, and while literally Spaniards are still trying to conquer Mexico City, they go north and found Querétaro. And so Querétaro is actually an Otomí foundation with Catholic Franciscan sanction under Spanish rule. And for the first 30 years Querétaro is an Otomí city. Other than a priest or two there's nobody else there. They build the irrigation. They build grist mills. They built the town. They distribute the land. And Connín and his pals take large landed estates for themselves, but they make sure their followers all have these incredibly rich irrigated gardens at the core of the city, and of course, he very quickly... he can't remain Connín, he's baptized and he becomes Don Fernando de Tapia. John Tutino: And you think he's got to be a Spanish conquerer. C.M. Mayo: He's got to be a Spanish conquerer and it turns out, no! He's an Otomí trader who used to be called Connín! John Tutino: And it is the perfect example of how indigenous people weren't always broken. They saw opportunity. C.M. Mayo: It's a more complex story than what we're told at a public level. John Tutino: Yeah. And at a lot of scholarly levels. Then in the 17th century I find the great land owner at Valle de Santiago, a man who calls himself Don Diego de la Cruz. And I find enough to figure out he is the grandson of a recently freed mulatto, thus inevitably the great-grandson of a slave, but who has accumulated land and has married very well and who has claimed status as español, he's a Spaniard because status follows position, wealth, culture. And he's moved from Valle de Santiago to Celaya, so at least his immediate neighbors don't remember grandpa, the free mulatto, land engrosser, but all his wealth is still there. Surely everyone knows. And so he takes this forward and suddenly you see in an environment where there were about 15% of the population of the Bajío were African slaves, but unlike the way we've been taught to think about slavery, in New Spain the vast majority got free within a generation or two. How? Almost always by having children with free indigenous women, thus they free their offspring. C.M. Mayo: It's a very different concept of race. The concept of mestizaje, of "the cosmic race," the mix of the Spaniard and the indigenous... it seems to me that in part that's a post Revolution construction, because it doesn't include the Africans. John Tutino: Right. Well, if you look at censuses from the 1750s on, after two centuries of colonial life, for either any major urban area, including Mexico City or anyplace in the north where there weren't huge Pre-hispanic indigenous populations, all of those censuses show 40 to 60% of the population of mixed but including African ancestry, names mulatto part of the Moreno suggesting that. At Independence, good Mexican liberals said, "We want to erase ethnic discrimination so we'll erase ethnic categories." In the 1890s when Porfirio Díaz finally said, "I guess we have to do ethnic categories again in the census," the mixed population was approximately of the same dimensions, maybe slightly larger, but almost all the mulattos had disappeared and everyone's a mestizo. C.M. Mayo: They didn't get beamed up! John Tutino: No! They haven't gone away. And what one can say broadly... if you look at again, from Mexico City northward, the Mexican population is historically, we know as scholars, no more than two to three percent Europeans ever actually arrived. It's very tiny, before 20th century immigrations. Fifteen to twenty percent Africans. The rest, 75%, are of indigenous ancestry. And that's the mix in the mestizo. And if in the 18th century they called that "mixed mulatto" and if in the 19th and 20th century we've relabeled it "mestizo," but that's the mix. And the culture has increasingly hispanized, but that's the mix. C.M. Mayo: So it's far more complex than what we've been taught to believe. You said in Making a New World that you came first across the papers of Jose Sánchez Espinosa. John Tutino: He basically... History creates possibility for historians. After the Mexican Revolution when the great landed families of Mexico were faced with losing everything in the land reform, increasing numbers of them were looking for a way to land on their feet and they became willing to sell things like the family papers to libraries that had oil money, like the University of Texas. C.M. Mayo: With its great Nettie Benson Library. John Tutino: Right, and she was in fact there at the time as a young staffer. And so among the many sets of papers that ended up there were the papers of Don José Sánchez Espinosa. The irony is he had been almost unheard of. He wasn't a known figure historically. They bought his papers because his son acquired a noble title as Conde de Peñasco and was sort of an intellectual archeologist in the 19th century. Somebody thought it would interesting to have the Peñasco papers and along with them come the dad's papers. The dad when I finally read his papers, and I read them a bit, years ago in the '70s and then I went back and read them in great depth and detailthis guy is one of the five to 10 wealthiest landowners in Mexico, agribusiness men, not just a rentier between 1780 and 1830, and he ran estates from the outskirts of Mexico City toward Pachuca, owned the two biggest estates in the Bajío, La Griega east of Querétaro and Puerto de Nieto near San Miguel, and he almost owned what is now the state of San Luis Potosí. Those were his northern grazing lands. And when he married his son to the Conde de Peñasco [family], and took control of the Peñasco estates, he did essentially control the territory of the modern state of San Luis Potosí. Now, this guy's papers, I will simply say that he operated as a profit seeking, and when he thought necessary, backstabbing capitalist who would thrive in any boardroom I can imagine. He could have played in Wall Street, all right? Yet, he's a Catholic priest! And he comes from a family... he inherited the estates from his uncle, a Catholic priest. You've probably heard of the Conde de Santiago because their home in Mexico City is now the Museo de la Ciudad. They were the richest landowners in the Valley of Toluca and other areas. There was a period in the 1790s when in that very wealthy family, one sister had inherited the title of the estates and her younger sister was the business manager, and she was writing exactly parallel letters in the same period. "We will serve society and we will hold crops as drought builds and we will sell them at very high prices as a charity." So they have a discourse of intent I am convinced by reading their letters deeply believed Catholic, being in charity but they're simultaneously the perfect agribusiness people and they are profiting enormously. I mean one of the ways... I did a calculation at one point and figured out that Sánchez Espinosa in just a regular year made between 25,000 and 50,000 pesos a year at a time when one of his workers made 40 or 50 pesos a year. I must admit, and my wife Jane has been known to say, "Don't you sometimes feel like you're invading his privacy reading all of his letters?" And if you go through some of these... there's a whole chapter in the book that's really about him because he was my insight into how 18th century capitalism operated. C.M. Mayo: And he doesn't fit the categories of what we've been told. John Tutino: We've been told it's extraction, it's honor. And it's clear he's part of a larger community. Another figure I've been known to throw about just to put this in context: People also don't know that between 1776 and 1848 very interesting dates the peso and the dollar were one unit. The U.S. adopted the peso as its currency because of Spain using new Spanish pesos to help fund the War of Independence. We gave up the pound and adopted the peso by its other name, the dólar. But that's wonderful for historians because during that period we don't have to worry about exchange rates and values. They are a single currency. The richest man in Mexico was a miner who then bought huge former Jesuit estates named Conde de Regla, founder of the Monte de Piedad, still operates in Mexico City. With his spare change he founded the Monte de Piedad. With some more spare change he built out of pocket two ships of the line for the Spanish Navy. It's as if Bill Gates built two nuclear aircraft carriers for Barack Obama. This is the level of money the Conde de Regla had, and setting those contributions aside, he left an estate of six and a half million pesos to split among his six kids. George Washington, reputably a wealthy Virginia land owner of the same era, had an estate worth 500,000. In other words, these folks are monied in a way the world...the only people I believe competed on this is the emerging British industrial aristocracy. So anyway, Sánchez Espinosa is not alone. He's part of this community. And over the years, though we don't have correspondence, letters for the Conde de Regla family, I've been in a lot of their account books and a lot of their land titles, and wills and things. As I say, these are people who would know how to operate in any boardroom today. C.M. Mayo: They were quite sophisticated. So this idea of these Spanish aristocrats just kind of lashing the Indians and worrying about their honor, that's not really an accurate picture. John Tutino: And not only that, but certainly in the north, work production is monetized. This image of forced labor being extracted and while, again, there's some of that at the beginning, more of it in the center south than in the north, but it is just vanishing around 1600. And labor is buy-for- pay. Wage rates change as markets change, as one would expect. Land is either produced for markets or rented for cash rents. This is a thoroughly monetized economy and indigenous peoples, as well as all these emerging mixed peoples, negotiate as they can in this highly commercialized world, and this is what gets complicated. We sort of think of well, racial ethnic discrimination sets deep inequalities, thus all of this fluidly in amalgamation somehow should be breaking inequalities. The answer is no. It's a different way of organizing normal human inequality. I would love to find an egalitarian society but I've been a historian for a long time [laughs] and they aren't out there. But it's a different, more fluid way. C.M. Mayo: Well, that was what's strange. I realize we're talking about the 16th and 17th century, but that struck me too about modern Mexico, as someone coming from the United States, that our concepts and categories of race are very different in the United States than they are in Mexico. What was that lawsuit from Louisiana? It was like the great-great-great-great-grandfather was black so [though she didn't look at all back] she was black on her passport and then she sued, and it went all the way to the Supreme Court. And that was in 1970! John Tutino: Right. No, it was up for a long time. One-sixteenth. C.M. Mayo: Yeah. And that idea of the polarity, you're either white or you're black, is something that in Mexico just doesn't compute. It's a very different way of thinking about race. John Tutino: It is, and it's hard to say... I mean, one cannot say there are no discriminations against people of greater color than Mexico. C.M. Mayo: I've seen it. John Tutino: It's there. But at the same time there are not sharp line discriminations. They're not either/or. They're complex, and there is an enormous amount of room for both, shall we say, wealth, but also intellectual achievement to move people into higher realms, more open realms. And in fact there is no shortage of people who... it's so hard to find the right language... of apparent primarily European ancestry who spend their lives in the lower half of Mexican society working for a living. It's not like everybody of apparent European ancestry is lodged in Polanco and Lomas de Chapultepec and everyone working for a living... It's an enormously complex, fluid society with a variety of openings, yet still enduring inequalities limits, et cetera, but it's a different way. And maybe getting ahead of the things you want to talk about, but one of the most unexpected essays that was written for the Mexico and Mexicans volume, when I invited Ramón Gutiérrez to contribute... I knew Ramón as the leading Mexican-American historian of New Mexico, and I expected he was going to write about New Mexico's place in the United States, and to a degree he did, but what he really wanted to write about was how mestizaje, the Mexican openness to amalgamation is, has, and continues to function as a positive challenge to U.S. racial polarities. And that it's not perfect, it's not different, but the West is not nearly as polarized as the East, and he argues persuasively, it is because of enduring legacies of Mexican settlement, Mexican humans, Mexican presence that creates this, and I drew on him to make the outrageous statement I will say some people told me I shouldn't say it, but I don't take advice well, and we were writing this right around the election first term of President Obama that the United States might one day note that we had just elected our first mestizo president. And it dawned on me that Barack Obama actually ran for president as a broadly categorized mestizo, human of mixed cultural, biological, social ancestry. And the day he was inaugurated having been in D.C. that day, it was so powerfully clear the American media made him the first African American president. They made him the first black president on the day he was inaugurated. And I thought that was a wonderful illustration of the tensions, the possibilities, the openness, but also the limits that Ramón had written about, that it's not that Mexican openness, mestizaje, was going to replace American polarities, but that it's going to contest them. It's going to interact with them. It's going to give us other possibilities. And boy, every time I go back to Texas, which is usually to a mix of Houston/Austin/San Antonio and Corpus, where I have all bunches of friends, boy, do I see that amalgamation charging forward in ways you don't see... Well, you see it in D.C. too, but you don't see it everywhere or quite as accelerated in the United States, yet. C.M. Mayo: It's a blow-the-top-of-your-head-off kind of essay. John Tutino: Well, thank you, and again, Ramón... It's an essay I never imagined. C.M. Mayo: What is so interesting to me about this is that we have so many categories and how we think about things, because we've told maybe in elementary school, maybe by our parents and our grandparents, and I think sometimes a lot of these ideas of what is Mexico, or who were the Conquistadors, or what was this or what was that, oftentimes can have their roots in propaganda that had to do with a war. It might be the propaganda about a revolution, about the civil war, about the U.S.-Mexico War, and it just gets repeated and repeated, so that we've heard it so many times that we just take it unquestioningly without asking, who said that in the first place and what was their motivation to say that? The other thing... I mean people have talked about, if you went to school in California the image of the mission which is the only presence of California, historically almost. C.M. Mayo: I was appalled! I mean, appalled is actually too nice a word, when I started researching the history of the Baja California missions and I realized what a truncated bunch of mythology I had been told. The California missions began in Loreto with the Jesuits. They did not begin in San Diego. John Tutino: Yes. And do you know who funded the Baja California missions? John Tutino: Who put together the estates that Sánchez Espinosa had inherited by the...so he's a priest. So he's the first of the priest entrepreneurs. It goes through Ocío and then this fellow named Espinosa y Navarijo and then Sánchez Espinoza. So it's Querétaro money that is doing this. C.M. Mayo: Right. That powerhouse and coming back to the complexity of the racial and ethnic, I had been told it was all Spanish padres. C.M. Mayo: Well, some were. John Tutino: But you know where they trained? C.M. Mayo: But you look at the Jesuits they were from Milan, Italy. They were from Sicily. They were from Poland, Scotland, France, Germany. I mean, to characterize the Jesuits as Spanish padres is more than a stretch. John Tutino: Right. And after the Jesuits are gone... to just put this connection together, and to get it close to Marfa, the San Saba Mission was founded and funded by the Conde de Regla, Romero de Terreros, with one of his own cousins as the leading Franciscan who funded it, and again, the trainings in Querétaro. And then later in Alta California, [Junípero] Serra and company were all trained in Querétaro, started in the Sierra Gorda, and after learning their trade there, if you will, go north, and missions matter but they're not alone. They are an institution aiming to transit independent, non-Christian, native peoples to lives of settled, sedentary life as agriculturalists and Christians. And what one sees is that they were often interested in the technologies of cultivation, livestock raising, weaving, and, shall we say, open to debating the value of Christianity and taking from it what they wanted. The image is not of indigenous people going and being locked in there and pummeled, but what we're more and more learning is that they were kind of like... people came and went. In a year of drought they'd go live there, be fed and learn what they did, in a good year they'd go back off and live independently. They would come and go. They were institutions of acculturation and adaptation. Some people decided to stay permanently. Some visit for a while and go back off and live. And so they are institutions that function as this commercial society is driving north into Texas, New Mexico, and California, and it's looking for mines, building commercial agriculture, commercial ranching, et cetera. It's engaging these indigenous peoples. They're not going to live free of it. Europeans are bringing the deadly diseases that come with them that New World peoples have never met. Native Americans are going to face those diseases anytime they have contact with the rest of the world. The death rates are appalling, and the missions operated as institutions of adaptation in the face of deadly diseases, the Spanish commercial pressures. You could learn new techniques. You could be fed in a tough year. They should neither be idealized as somehow, you know, "God's work on Earth," in my view, nor should they be put into the categories they sometimes are as concentration camps. They were neither. But they were very difficult points of transition and you find that many indigenous peoples, the survivors of the diseases come out. They now graze livestock. They ride horses. They... you know, Navajos did not raise sheep nor weave wool before they encountered Europeans. C.M. Mayo: Well, and this is the story of West Texas. John Tutino: Right. Exactly. The grazing. And this is all coming north into that area. And while it is true these were not densely populated regions while they were under Spanish and then Mexican rule there were maybe 10,000 people in what we might call greater San Antonio and south Texas, maybe 50,000 people, but a majority of them Pueblos in New Mexico. Another maybe 8 or 10,000 people up the coast of California. So one doesn't want to overplay this, though then it's worth keeping in mind that when San Francisco was founded in 1776, none of the great metropolitan ports of British North American had more than 7,000 people in them. These are small settlements on the coast, everywhere. They are bringing legacies of commercial agriculture, irrigated agriculture, grazing, diverse livestock and doing it as commercial activity and constantly searching for mining wealth. C.M. Mayo: Constantly searching for mining wealth, and that was what brought them into Far West Texas. John Tutino: And that's what's driving them there. Right. And they're looking for it but the ultimate irony, of course, is the great mining wealth of California is found just after the U.S. takes over and, for a whole lot of complex reasons, the great mining wealth of the Colorado Front Range was found just after. But it's the search and it's what they're bringing. One of the things to help emphasize this legacy let's set the war aside. It's a war. The U.S. takes the northern half of the territory claimed by Mexico and it is a far more important historical moment than we normally think about. I look at my Georgetown students and I say, I can't tell you what would have been, but imagine the United States without everything from Texas to California, and it would be a lesser place than it is today. Imagine Mexico with everything from Texas to California. It would be something other than it is today. Much would have intervened. I won't predict the outcome. But in that transfer... the great Yale historian who became president of Yale named Howard Lamar, wrote the book* on how those lands became U.S. territories and states, and one of the things he documents without, I believe, fully understanding it, while the early U.S. settlers insisted on bringing U.S. political systems, the locals lobbied hard to keep Hispanic/Mexican land law, mining law, and labor law. Now if you keep land law, mining law, and labor law, you're essentially saying, "We're going to layer a U.S. polity on the economy of New Spain." And I would argue that's what we have done, and that Anglo Americans become the entrepreneurs in this economy by the late 19th century. What we don't recognize is that they mostly did that by marrying the heiress daughters of wealthy Mexicans in almost every case. Yes, there's some theft, yes, there's some pressure. And thus many of these emerging Anglo entrepreneurial households from south Texas through California, the public image of the politically active commercially public guy is an Anglo, but the household is still being run by a Mexican mom. Everybody knows it is the Benedicts, and how badly when, or early on, the Mexicans are treated, and the whole movie's premise is how they come to incorporate a Mexican in the family and start to become open. What I hear no one commenting about, early on much of the tension is between Bick Benedict, [played by] Rock Hudson, and his sister, who runs the ranch. What's his sister's name? Luz. C.M. Mayo: Aha. Luz. Very common Mexican name. John Tutino: And boy, you don't have a lot of late 19th century, early 20th century Anglo Texans... I suspect that Edna Ferber in her own researched way, and she did, I know for example she did enough research. The Mexican doctor, Dr. Guerra, in the book is based on her having come to know and interview Dr. Hector García in Corpus who was the medical doctor who founded the American GI Forum in the Civil Rights Movement, and she met him, and she talked to him, so she did her research. And in the '50s how much could you say really publicly? But when I see Luz, who has to be María de la Luz, I'm betting.... And what's the name of the ranch? John Tutino: The Reata. This isn't the Long, the Mustang or even that would be the Musteño, right? I'm betting that the Benedicts' ranch came from marrying Hispanic/Mexican entrepreneurial money. It's a read. [Laughs] It's hard to know. So you have this fusion, and my own attempt at contribution to the Mexico and Mexicans book is to try to suggest that when we started to say, in the '70s, '80s, and '90s, "the Sunbelt in the southwest is really the most truly capitalist part of the U.S.," among the reasons for that was its roots in New Spain. C.M. Mayo: And that would probably not occur to almost anyone living there. It wasn't just in the 19th century! This fusion is going on yet somehow it has to nestle into what I want to call the Alamo narrative, that we created ourselves in opposition at war with them. It's enormously complex. You're right. We just... I want to say, sometimes we refuse to see what's in front of us. C.M. Mayo: Yeah. And I think sometimes what happens...and I'm just speaking of Americans in general, people tend to think they know Mexico because they see it movies and television and in the news, and so they think, "Oh, that's Mexico. I got that all figured out." Maybe they've gone to Cancun, or maybe they've gone to Acapulco, and, you know, "that's Mexico." They wrap it up with a little bow and it's far more complex than that. John Tutino: ...in which there are great accomplishments and grand difficulties. People ask me, "How did you, a kid from Massachusetts, end up committing your life to studying and understanding Mexico?" And the first answer is, a great Spanish teacher who got me to Mexico at 17, but after that start it is having encountered what I call the amazing adaptive, creative resilience of Mexicans. Whatever the accomplishments or the difficulties, Mexicans as I have known them carry on, go forward more often than not. They don't get depressed. They find a way to make the best of it and go forward, and this is the Mexico and the Mexicans I have known now and I first went to Mexico in 1965. And yet in the media, in the United States... I live in DC now but I've lived in Boston, Texas, Minnesota, California. I see Mexicans and... they are related, there is drug violence and there is corruption. When I told my freshmen at Georgetown this course that was going to be around a series of films that portrayed Mexico in the United States. First reaction was, "What do we need to see? We all saw 'Traffic.'" [Laughs] I brought them back to see "Viva Zapata" with Marlon Brando playing the hero- the Mexican as hero played by Marlon Brando. Then "Giant," where, in the end Rock Hudson will get into a fist fight to defend his Mexican daughter-in-law and grandson. And then several other more... I'd love to show "Lone Star." C.M. Mayo: "The Three Burials of Melquiades Estrada." Did you have that one? John Tutino: No. I didn't use that. Again, you have to make choices. C.M. Mayo: That's my favorite. John Tutino: But anyhow, the construction of the image of Mexico in the United States is just depressing. And it's based I believe again, NEH will fund a seminar on the interpenetration but you can't call them inseparable histories. We need Mexico as an other. We can't deal with it as an us. C.M. Mayo: One of the things that really struck me about, of the many paradigms your book explodes, is the one we often think of immigrating, people crossing the Rio Grande, as something recent, and if you follow this paradigm and say, "Well, the engine of movement north came from the Bajío, from Querétaro in the 16th century..."
John Tutino: Connín left Jilotepec, north of Mexico City, to go to Querétaro. He almost found that right there, and then from Querétaro the northward flow has been going since the early 16th century. Going north has been a tradition far longer than going west in this continent. And the first thing that has to be recognized is that the border moved. C.M. Mayo: Right. So something that was a natural flow north, suddenly the legal status changed. So it's not a recent thing. It has very deep centuries-long roots. John Tutino: Right. And it obviously for a long time in the 19th century it was essentially continuing to places that had once been New Spain or Mexico. But it's gone beyond that, and again, now Mexicans are the largest Hispanic group in New York City by a lot. And people go, "What?!" Because it's not really, again, sort of the public image of Hispanic New York [which] tends to be people from the Dominican Republic or from Puerto Rico. But not only is it Mexicans, but it is largely Mixtecs from southern Puebla, et cetera, who have moved to New York in amazing numbers and are bringing things Mexican. C.M. Mayo: That's a very different than being from Jalisco or being from Veracruz, or being from Polanco in Mexico City. They are as different as being Irish or Russian, or Finnish or Greek. They're very different. John Tutino: They're very different but I'm going to say, two generations in New York City, we're going to see a new mesitzaje and with the Mixtecs marrying a variety of other New Yorkers, some of them Latino and others... And again, I think this is the interesting openness here and the change... And again, they come and they start at the bottom and they face enormous difficulties of distance and survival and work, yet they find a way to survive and make themselves necessary, important, et cetera. One of the things we made a conscious decision about, we presume that with the title Mexico and Mexicans in the Making of the United States, people's first reaction would be, literally, the construction trades. That's the one thing we all know. Mexicans built the railroads. They built our buildings. They built our highways. They continue to do that, and we wanted to say, "But they didn't just do that building, that in the much broader sense of making Mexicans have been..."
C.M. Mayo: Well, and there was one really key episode that you talk about in both books, which is the role of Mexico in the U.S. Civil War, in literally the cause of the war and the continuation of the war. John Tutino: Yeah. And this again, I want to say this... in terms of this, this is me picking up and expanding upon a number of scholars. It has actually been reasonably mainstream in US history about the last... in the scholarly side of U.S. history. Don't think it's showing up in Ken Burns' "Civil War," but scholarly U.S. history has finally recognized in the last 15 years or so that essentially the problem with slavery had been resolved in the Missouri Compromise, and the acquisition of the territories from Mexico reopen the question of the expansion of slavery, and from there... and the attempt to trade slave Texas for free California held for about five years. They couldn't hold longer than that and it is that, that leads to the Civil War, and a number of scholars have seen that. They haven't seen it fully in the context of why that war happened in the first place, is what I would say. Then the other essay in the book is really by David Montejano, who in many ways, certainly as a historian, is probably the beacon Mexican American historian writing. He wrote back in the '80s a book called Anglos and Mexicans in the Making of Texas. Won every award in Texas, in U.S. Western history. It's still... if you want to understand the history of Texas from a binational, bicultural perspective, it's in the book to read, and now he's recently written two new volumes on the Chicano movement in San Antonio in the '60s and '70s. The first one he does as pure scholar; the second one he was a high school kid in San Antonio so he had to wait, as he said, to see perspective. But what he's now writing and what his essay* in our volume is, the Civil War was fought around slavery. Slavery mattered not just because southern planters were committed to it, but because it was the basis of their sustaining their role in the rise in capitalism and industrial textile Britain. People who would separate British textile industrialization from the slavery of the American South, they're just playing blind separations. They are one economy. They transformed the world between 1800 and 1860. Thus the South knows it needs to preserve slavery to preserve its role in the world economy, and they're dedicated to it. The war breaks out. How does the South fight? The union blockades exports. Mexican merchants and carters in Texas, and some based in Monterrey and on both sides of the Rio Grande near the border, went into the business of transporting buying by a variety of means, southern cotton, crossing the Rio Grande into northern Mexico, stamping it "Mexican Cotton," putting it out through Matamoros as Mexican cotton. Montejano immediately points out this was not being done with the slightest sympathy for the South or slavery. This was pure capitalism, an opportunity while your neighbors are at war. They shipped the cotton and it went to Havana, and most of it was said to go from Havanawhich is still in Spanish possessionto England. And it's keeping the British industrial economy going during the Civil War while the Brits are claiming they're adamantly against slavery and would like to see it end. That's their public stance in the world. But what we also now know is that close to half of the cotton that went to Havana actually then went to New England and it kept the cotton textile mills of Massachusetts, et cetera, going. So Mexicans engineered a cycle that profited them quite nicely, marking southern slave-grown cotton as Mexican, selling it to both Britain and the Union to keep the British and the Union economies going. In a sense, it kept the Civil War going economically because both the southern economy, the northern economy, the global economy, kept going. And then there's an epilogue to this. This is one of the transforming moments in the modern world economy because it is people, whether Patricio Milmo who is fact an Irish immigrant of Monterrey the capital that later built Monterrey was made in this trade. People ask, "Why did Monterrey suddenly emerge as the great capitalist place in the north?" Because of the capitalist trade there. It's not just that. The great exporter of Mexican cotton, beyond the Milmos and San Románs who were based in Monterey, was Charles Stillman, a Connecticut Yankee who founded National City Bank of New York with the money he made exporting cotton stamped as Mexican during the Civil War. Now I don't know a better way to complicate history, the links between the U.S. and Mexico. We see the Civil War as the defining conflict that made us and out of it we say, "We've confirmed ourselves as the great new power in global capitalism." And Mexicans are in the middle of that, and Monterrey comes out of it, and National City Bank still around as a pretty important institution. One of its real ironies was it was not one of the key banks that Mexico had to face in the debt crisis of the '80s. And the famous episode when Silva Herzog* went to the banks and they said, "You owe us so much, you have a problem." And he looked back and said, "No. We owe you so much, you have a problem." And again this bank was built on working at the mouth of the Rio Grande in southern cotton stamped "Mexican" and all this. All of these two projects actually... I want to thank you for seeing, the goal is a paradigm change. The goal is to rethink the historical interpenetration of these two societies, but the biggest thing I would emphasize is, as we see the paradigm change, the questions to answer are out there hugely. We haven't solved them. We haven't resolved them. We have said, "Okay, let's start looking at things in new ways and we think about this." C.M. Mayo: Come back to West Texas and we think about the issues in the present, which would be illegal immigration and drugs, and so on and so forth. They do affect the border. C.M. Mayo: And we think about the history. We need to put it in a very different context than maybe we have in the past, and ask, is what we're being told the truth or just a biased piece of the truth? John Tutino: It's a piece of the truth. I am the last person who wants to defend the global drug trade. This is not something I admire, et cetera. But actually a colleague of mine who's worked on another project with me who is a historian, but who's jointly appointed at the University of Houston Business School, they have done studies and they believe that, after energy, the second largest commodity economy in the world is drugs, if you could count this in terms of value and trade. Now part of that value is generated by its illegality, right? Illegality drives up its price. And I've been known to cynically think, "Okay. Instead of seeing Mexico as a backward place suddenly finding drugs to pummel us with..." First of all the demand is here, so let's put that up front and just accept that. But then I say, "If we recognize that Mexico is a place rooted in capitalist entrepreneurship for centuries and for complex reasons the businesses open to Mexican entrepreneurs have been a shrinking domain over the past centuries: Silver is no longer the central commodity in the world; Mexico has petroleum but mostly at the moment enough for its own needs, et cetera." The irony I grapple with is, so the one major global profit-seeking commodity that is open is the one we define as illegal. And thus it creates a space, a place for entrepreneurship for people with a historic legacy, tradition of entrepreneurship, with fewer and fewer places to exercise it, for a variety of reason, and it's not a question... and one of the ways I have been increasingly just trying to rethink the world is, we have this belief, maybe unnecessary belief, that with the right policies every country can be prosperous. Everybody says it was a society looking for a government, which it was, but we haven't recognized it was a society looking for an economy in the 19th century. It's old silver economy was gone. Britain took the world toward gold. We talk in this country about going onto the gold standard and demonetizing silver. What does it mean for Mexico when the U.S. demonetizes silver and finally convinces Mexico to demonetize silver, which happened? Is it an accident on the eve of the Mexican Revolution, Mexico demonetized silver? Now again, it was actually probably the right decision to make in the economy of the time and the policies of the time. I just cite it as a sign that what had once made Mexico absolutely pivotal by its resource endowment, and what it produced for the world, is going away and it's been looking for a new role ever since. And it's still. And I think it's fair to say that... how do I put this? Actually, you go back to the late 19th century and what was figured out is that Mexico had to become an integrated aspect of the U.S. economy. That's a good deal of what Porfirio Díaz was doing. If you watch him build railroads, commodities, et cetera. He didn't announce that as a policy à la NAFTA, but it was what he was doing. The Mexican Revolution adopted the dream of an independent national economy and gave it a shot. I'll go so far as to say, maybe it could have worked with petroleum, with a few other things. But the late 20th century population explosion in a country of limited resources, limited agricultural resources, et cetera, just undermined for Mexico an independent national economy. So they've been searching [for] it and in a sense Mexico has twice tried integration with the United States. Once, 1870s to 1910, and actually I'd state the second one from World War II when Cárdenas took the lead in actively linking Mexico to the U.S., and NAFTA is in many ways a negotiated culmination of that. Still searching. And actually the rumor I have is that Mexico is doing okay these days. [Laughs] But it's been this search. One of the things... it's not just the U.S. that wants separate histories. The rhetoric of Mexico is still the search for national development at a time when every observer not committed to rhetoric sees that what is happening with Mexico it's being integrated with the United States into the world, and it's a search for a new economy, and hopefully we're stabilizing a new polity to go with it. But again, all of this integration... and what we're trying to do here is to get people to think about Mexico as a part of that long-term history. C.M. 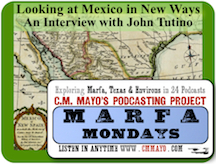 Mayo: That was Professor John Tutino of Georgetown University, the author of Making a New World: Founding Capitalism in the Bajío and Spanish North America, and editor of Mexico and Mexicans in the Making of the United States. Those books are available from the publishers, Duke University Press and University of Texas Press, respectively, and you can also find them through Amazon.com or have any bookstore order them for you. Your local library should be able to get you a copy as well. Those of you who are familiar with the history of Far West Texas will have noticed that in this interview we did not discuss the Apachería or Desploblado as this region was known to during, and for some time after Spanish Colonial times. That's a topic for another podcast. I will be doing one about Apaches, and there will be Comanches, too. I invite you to listen in to the podcasts anytime and, for updates about new podcasts, get my free newsletter at cmmayo.com and/or follow me on Twitter @marfamondays.